The CRS storage ring at the Max Planck Institute for Nuclear Physics shortly before cooling down: In this unique instrument, molecular ions are cooled to minus 263 degrees Celsius and sent onto a 35.4-meter long orbit at an extremely low pressure in order to investigate astrochemical processes and their quantum mechanical principles. Researchers at the Max Planck Institute for Nuclear Physics conducted initial experiments in the Cryogenic Storage Ring. The Cryogenic Storage Ring can reproduce the chemical conditions in space in the laboratory. It is now easier to investigate space chemistry on Earth as well. Researchers at the Max Planck Institute for Nuclear Physics (MPIK) in Heidelberg have conducted initial experiments in a unique electrostatic storage ring for ultra-cold molecules, in which they reproduce the conditions found in space. After spending several years developing and building the storage ring, the physicists now for the first time kept negatively charged molecules – hydroxide ions (OH–) to be precise – on orbit in the ring at only a few degrees above absolute zero and very low pressure, and they have also started to experiment with the particles. The CSR (Cryogenic Storage Ring) now enables them to investigate the chemistry of interstellar clouds in the laboratory and to gain fundamental insights into the ‘inner dynamics’ of molecules. The low temperatures in space do not exactly provide ideal conditions for chemical reactions, which usually proceed better, or sometimes only, with a little bit of heat. Nevertheless, more than 180 molecules have already been discovered in space. It is possible that even elementary building blocks of life formed there, and could then have been brought to Earth on comets. Astrophysicists are therefore not the only ones interested in knowing how chemical processes in interstellar clouds proceed. It is clear that these follow completely different routes to the chemistry on Earth. The scientists at the Max Planck Institute for Nuclear Physics therefore now want to investigate astrochemical processes in the laboratory using the CSR , which they have realized with the help of researchers at the Weizmann Institute in Rehovot/Israel. A lot of experimental skill, and a little patience as well, are needed to imitate conditions in space in the laboratory: it took nearly three weeks just to cool the storage ring to around minus 263 degrees Celsius, i.e. only a few degrees above absolute zero. In the process, the pressure dropped to below 10-13 millibar, according to initial estimates; this is less than a 10 millionth part of a billionth of normal air pressure, which is 1000 millibar. It is difficult to measure such a low pressure accurately. “The purely electrostatic ion optics, extremely low pressure and very low temperatures make it possible to store even very large molecular ions in extremely low quantum states in the ring,” is how Robert von Hahn, who headed the development of the CSR, summarizes its most important characteristics. In a large outer vacuum chamber, copper ribbons transfer the low temperatures of circulating cooling pipes to an inner vacuum chamber in which the ions move on their orbits in order to cool the molecules in the CSR storage ring to a few degrees Celsius above absolute zero. This is where a tunable laser comes into play. Its beam impinges on the stored hydroxide ions (OH–) causing them to lose an electron. OH radicals form and – since they have no charge – they leave the orbit and land on a detector. The color of the laser light which causes this to happen indicates the energy level that the OH– ion was occupying when it was hit, i.e. how much internal energy it had before it absorbed the energy of the laser light. An initial evaluation of the data showed that not only had the internal oscillation of the OH– ions come to a halt as far as possible, but their rotation as well – indications that the molecules had indeed attained interstellar temperatures during the time they were stored in the CSR. 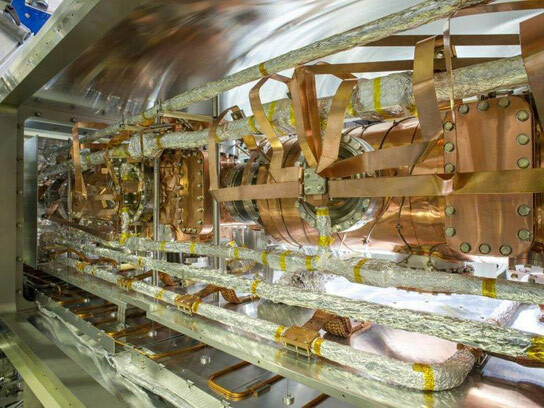 “It looks very much as if our new ‘machine’ is fulfilling all expectations,” says Klaus Blaum, Director and head of the Stored and Cooled Ions Department at the Max Planck Institute for Nuclear Physics. “The CSR will therefore be able to bring all its strengths to bear in our planned experiments on the chemistry of space,” adds Holger Kreckel, Leader of the ASTROLAB Group at the Heidelberg-based Institute. What is the purpose of an ultra-cold storage ring? The particle densities in interstellar clouds are extremely low. The temperatures drop very close to absolute zero, down to 10 Kelvin, i.e. minus 263 degrees Celsius. This is why interstellar chemistry takes completely different paths to those on Earth. Experiments under comparable conditions are necessary to understand how interstellar molecules are able to form and survive. Researchers have identified processes between charged molecules, the molecular ions, and neutral atoms and molecules as being the key to the molecular diversity in space. Most free molecular ions are extremely reactive, which is why they can exist for a longer time only in an extreme vacuum. The inner dynamics of the molecules are determined by the quantum dynamics of their atomic nuclei and electrons. Interactions with other molecules, light or thermal radiation can excite the atoms within the molecules and trigger chemical reactions or cause the molecules to emit light. Sensitive observations of molecular processes, as are possible in the CSR, thus provide an insight into the sub-microscopic many-particle quantum dynamics within the molecules, and it is these which form the basis of the chemistry. Inside the inner vacuum chamber, 16 units each with four electrodes generate the electrostatic fields which keep the ions on their orbits. The Cryogenic Storage Ring (CSR) at the MPIK is a new, unique tool for these types of experiments. Ion beams are stored in an extremely low vacuum, produced by cryogenic temperatures. The CSR is also suitable for storing heavy molecules, even clusters of several molecules. On their 35.4-meter circuit through the storage ring they pass through four straight interaction sections, where they collide with other atomic particles or are excited by laser light. On the straight sections, powerful detection instruments also provide data on individual molecular reaction processes. Only purely electrostatic ion optics can be used for experiments with very heavy molecules or clusters; suitable magnetic deflection systems would have to have enormous dimensions. 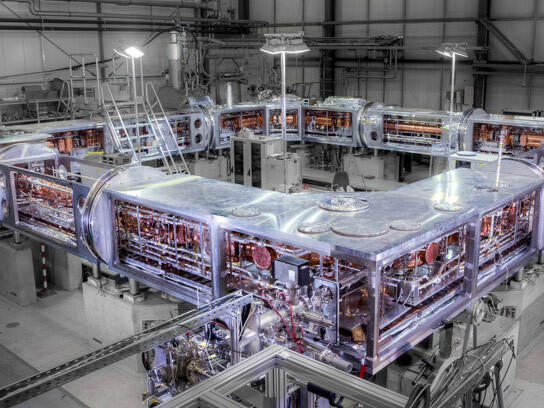 Unlike the set-up in a magnetic system, the deflecting and focusing electrostatic units sit inside the vacuum chamber. The system utilizes a total of 16 quadrupole units for the beam focusing and 16 deflection units. The vacuum must be much better than in other ion storage rings: in the CSR, the density must be 1016 times less than in the atmosphere, corresponding to a pressure below 10-13 mbar. 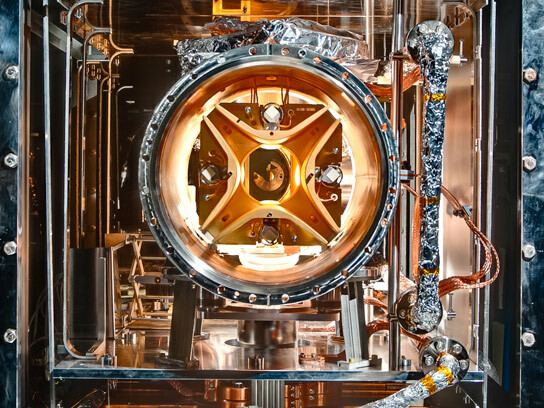 The vacuum chamber surrounding the ion beam in the CSR has a temperature of around minus 263 degrees Celsius. The temperature is even lower at 28 points distributed within the ring (nearly minus 271 degrees Celsius) in order to also freeze out the most volatile gases on a cold surface. A refrigerator distributes liquid helium (initially in the superfluid state) in a system of pipes which winds around the ring several times. In accordance with the onion skin principle, internal walls screen the terrestrial thermal radiation to minus 230 degrees Celsius or minus 180 degrees Celsius. All this takes place in an outer vacuum system – the insulating vacuum which prevents any heat conduction to the outside. The mechanical design is determined by the cryogenic temperature requirement. Nearly all materials shrink in the cold – a one-meter long stainless steel tube by around three millimeters when it is cooled from 20 degrees Celsius to -263 degrees Celsius. Flexible metal bellows decouple the components, and all components of the ion optics are anchored separately to concrete plinths. Be the first to comment on "Cryogenic Storage Ring Reproduces the Chemical Conditions of Space"